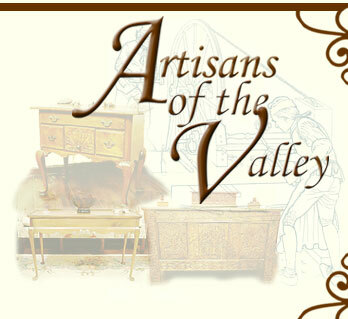 Artisans of the Valley offers museum quality period reproductions & original designs by commission including Gothic, Medieval, Tudor, and Renaissance periods. We offer full service museum quality antique and collectibles restoration/conservation services, modern furniture refinishing, and onsite furniture repair. We offer hand carving including wildlife, floral, leaf work, landscape, traditional period reproductions, ropes, vines, and figures in relief and in sculptural form. Our website is now over 500 pages, including galleries, feature articles, and educational sections. We extend an open invitation to explore our site, and contact us directly with any inquiries or questions you may have. Did you See us on EBRU-TV? - More info in a special eddition Newsletter! "Bob the Chainsaw Carver" & "New Wave Gothic News" New Artisans Article Portfolios! "Artistry that Goes with the Grain," Metropolitan Life's "What's your passion?" section of MetNews Daily. Published online June 12, 2008. "Master of the Shop" October � 2007 Princeton Magazine / North Jersey Media Group. Check out this recent article featuring Eric Saperstein of Artisans of the Valley. September 13, 2007 - Press Release - "Timberlane gets new timberwolf" - Hopewell Valley News, Sept 13th, 2007. This article features a project chainsaw carved by Bob Eigenrauch, Master Chainsaw Carver with hand detailing by Master Wood Carver Stanley D. Saperstein. 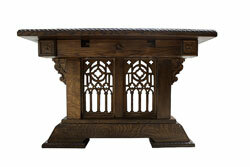 New Wave Gothic Dining Table & Entertainment Center in solid quarter sawn white oak. 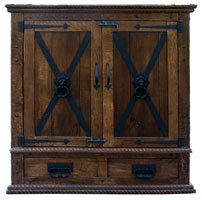 Check our Period Furniture section under Tables & Entertainment Centers. Recently completed a custom wildlife panel for Ted Nugent's Sunrize Safaris. Check back shortly, we have several very unique projects in progress now that will appear as website features shortly including a highly carved safari chest, a chess "puzzle" table, and a very unique restoration of a flame mahogany bedroom set. 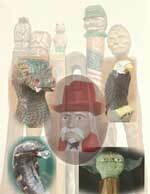 Featuring Stanley's Custom Walking Sticks, Staffs, & Canes and related restoration services. Our studio is open by Appointment.